The imagery of Wonderland is one that’s notably psychedelic–almost notoriously–to the point where it’s become a well-known pseudo-fact that author Lewis Carroll used drugs while penning his famous novel. This isn’t true. But countless tellings of the story carry such traits. Tim Burton’s is no different. Although, while being adamant about his version of Charlie and the Chocolate Factory not straying away from the original source material, his take on Wonderland differs quite a bit. But not in a bad way. In fact, this version is a refreshing new take on the classic story we all know. It would have been so easy to merely duplicate it, but Burton had something else in mind. Unlike the other adaptations, especially including the 1951 Disney version, Burton tries to create an emotional connection between Alice and the characters she encounters. Instead of Alice going through Wonderland and experiencing a sequence of disjointed events, her journey is all connected, giving the film an actual sense of cohesion. Starting off in the real world, 19-year-old Alice is on the verge of being forced into marrying some guy she doesn’t love. The people around her parallel traits of the characters we already know from Wonderland, foreshadowing what’s about to happen–in a sort of Wizard of Oz type of way. Then, right when it’s convenient, she follows an anthropomorphic white rabbit down a hole into Wonderland. Did I say Wonderland? I mean “Underland”. “Wonderland” is the name she gives it when she’s a little girl. Apparently this isn’t Alice’s first time here. But now that she’s older, she insists it’s always just been a dream. In fact, she says this about 10 times, and never seems to accept the reality of it all. But the characters all seem to know her, insisting that she is prophesied to defeat the Red Queen’s Jabberwocky. The film takes awhile to get anywhere, and the dialogue does a lot of rambling. However, we still seem to enjoy Alice’s adventures as though we are unfamiliar with the story ourselves. Because, in a way, we are. But it’s Burton’s auteurism that draws us in the most. His actualized vision is what draws us in and gives this film its unique thumbprint. Indeed dreamlike, Underland is a world all of its own. It’s much like Wonderland, except many of the bright colors are gone. This is a “Wonderland” that doesn’t juxtapose brightness with dystopian imagination. Because it’s completely dark and dystopian in almost every way–which isn’t necessarily a bad thing. Although, it may disappoint those hoping for a quintessential live-action adaptation. What prevents this film from being great is its tendency to meander. Seeming to be more focused on its impenetrable lexicon and non-sequiturs, it feels, at times, like the filmmakers don’t want us to know what’s going on. And feeling like an outsider when a movie should be enveloping you in its highly intricate world can be a frustrating experience. Filled with made-up words that even the most insane context clues won’t help us with, it never lets up. As though it’s proud of being cryptic. Or perhaps you can just credit it for its consistency. Whatever it is, at least it brings us closer to the title character in her own bemusement. All is forgiven during the last 25 minutes when everything finally makes sense and we realize that the film actually does have some great ideas. But, it turns out, all it had to do was simply explain what itself. The cast is all very good in their respective roles. Helena Bonham Carter is a marvel as the Red Queen, who acts as a spoiled child trapped in an insecure and manipulative dictator. Her head is oddly shaped, so her minions wear prosthetic noses and ears to make her feel more comfortable with her own distortions. I’m glad there’s a sequel about to come out, because I’ve always felt this film was more of a setup movie. And a good one, at that–just getting us accustomed to the world that’s been created. A world that feels very real. The film’s occasional off-kilter humor is noticed and appreciated. It adds to the oddness of it all–much in line with the spirit of Lewis Carroll and his sober-self. Upon watching this movie for the second time in preparation for the sequel, I’ve realized how funny it really is. Although much of the humor is subtle, the situations are priceless. For a film that seems fairly shallow and silly, it digs pretty deep and even gives off a grandiose vibe. The cast plays well together and feed off each other well. Those who are nostalgic about the ’80s will also appreciate this film as it gives plenty of nods to the decade. While the jokes are sharply written and aren’t simply dependent on one-liners, the dialogue could be a little less vulgar. Not that it bothers me a whole lot, but it feels as if a 16-year old boy wrote much of the characters’ responses to one another. When cursing isn’t used to enhance the dialogue it becomes distracting and a seemingly cheap way to get laughs from teens. 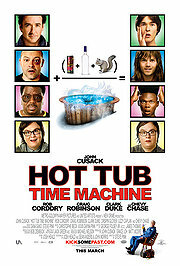 Other than that, I can’t complain too much about Hot Tub Time Machine because it never tries to be anything that it isn’t, and it’s a very unique addition to the comedy genre.